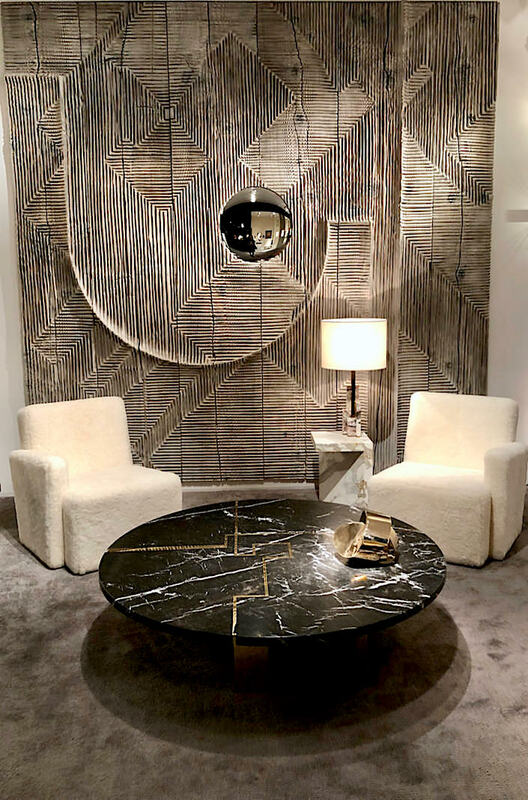 This past week marked the opening of the Salon Art + Design 2018 show at the Park Avenue Armory. 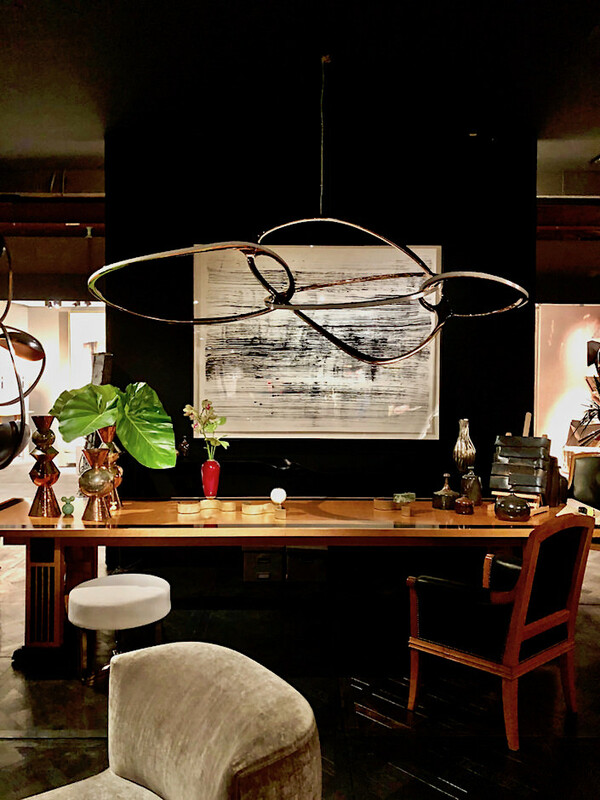 Including some of the world’s finest dealers, this show brings a wide and high quality range of fine and decorative art from ancient to contemporary, with an emphasis on distinctive 20th century and contemporary design. 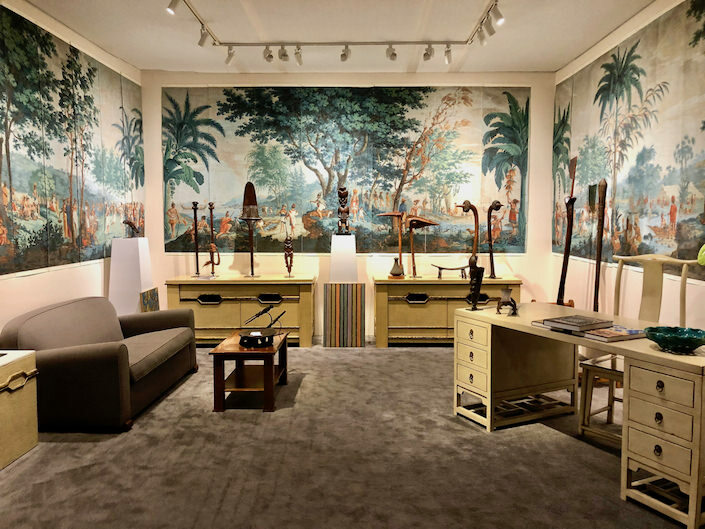 And if you’re in the NYC area, tomorrow is the final day to visit this always interesting and stylish show. I stopped by the very well attended press preview and opening evening for a peek. 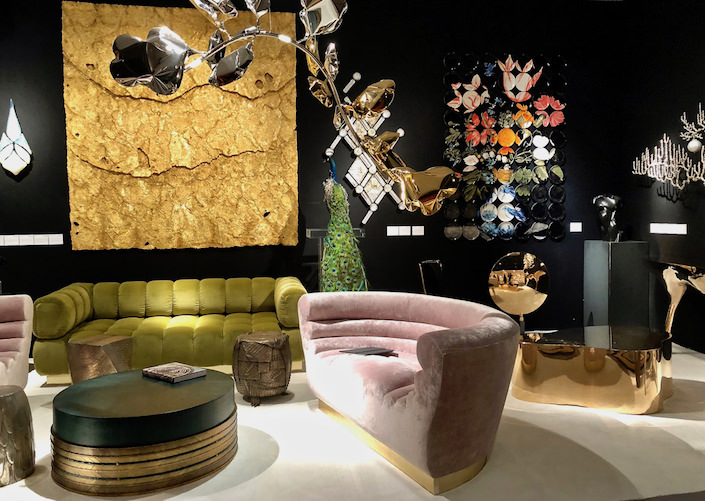 It was a social madhouse with a who’s who in design and art aficionados, marked by robust sales reported by many of the exhibitors. 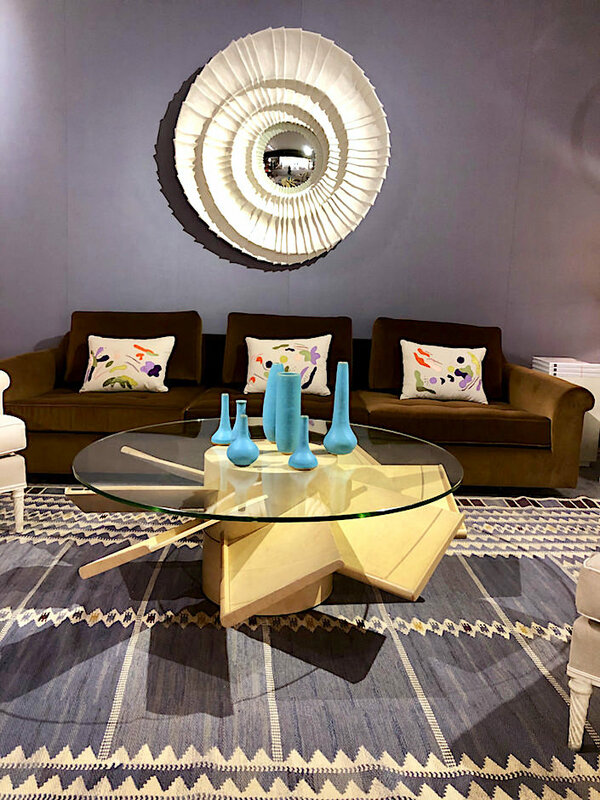 Here are just a few favorites starting with New York’s own Liz O’Brien, whose stunning booth was anchored by a dramatic Stephen Antonson mirror, Samuel Marx propellor table and crowd worthy Edward Wormley “Big Texan” sofa. 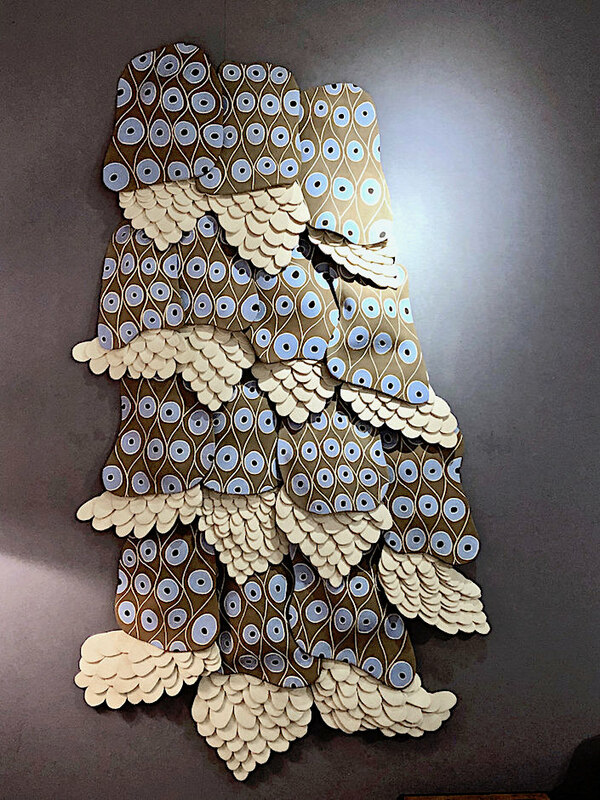 Also noteworthy is an amazing ceramic and wool felt wall sculpture by artist Jennifer Nocon, above, who also has lamp collection with David Netto, below. 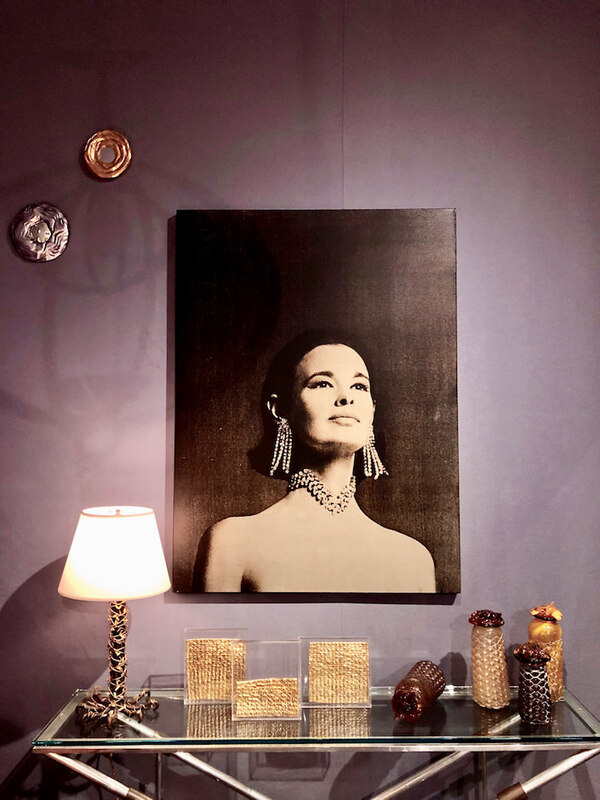 And I would be remiss if I didn’t include this chic corner centered on a 1960’s Scavullo silkscreen of Gloria Vanderbilt. 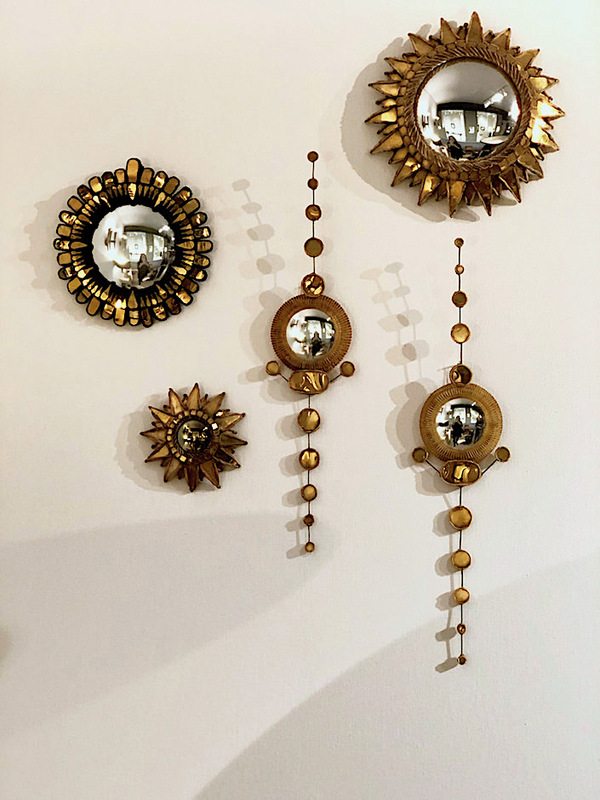 Above, two two elegant Nancy Lorenzo mirrors, a marvelous Paul Belvoir lamp and works by Judi Harvest, including her imaginative Honeybees and Murano Glass pieces. 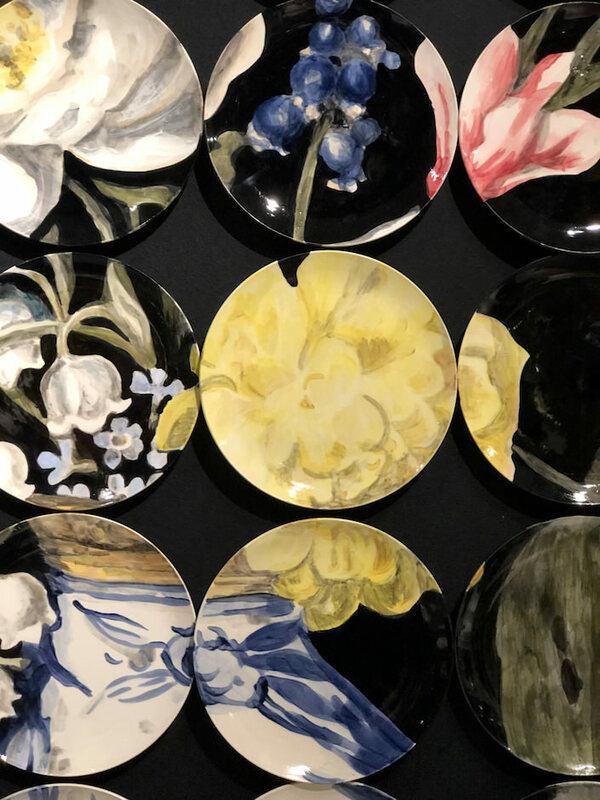 Maison Gerard is perennial favorite with their signature mix of old and new. 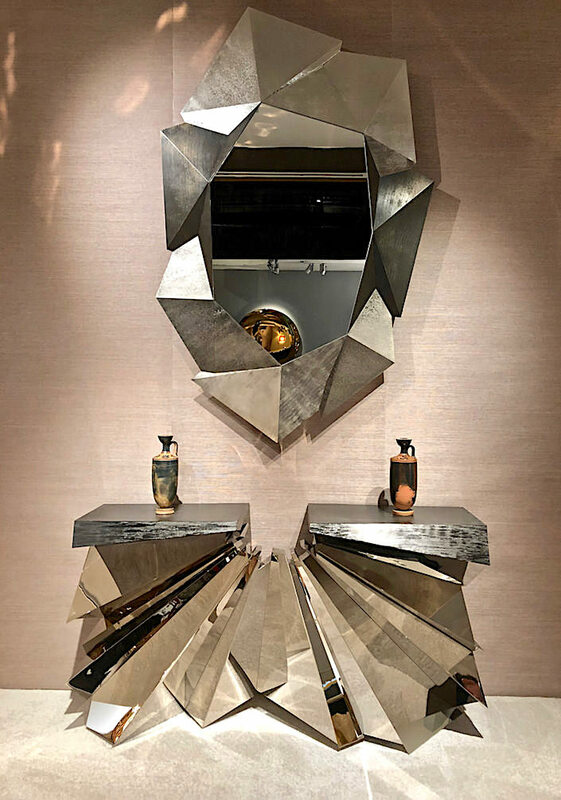 Below one of a series of screens by Christopher Côme and vase by Jaimal Odedra on a cabinet by Achille Salvagni. I am a long time fan of Irish lighting designer Niamh Barry and her On It Goes sculpture floated effortlessly over an enormous André Arbus table in front of Mary McDonnell’s Untitled 3. 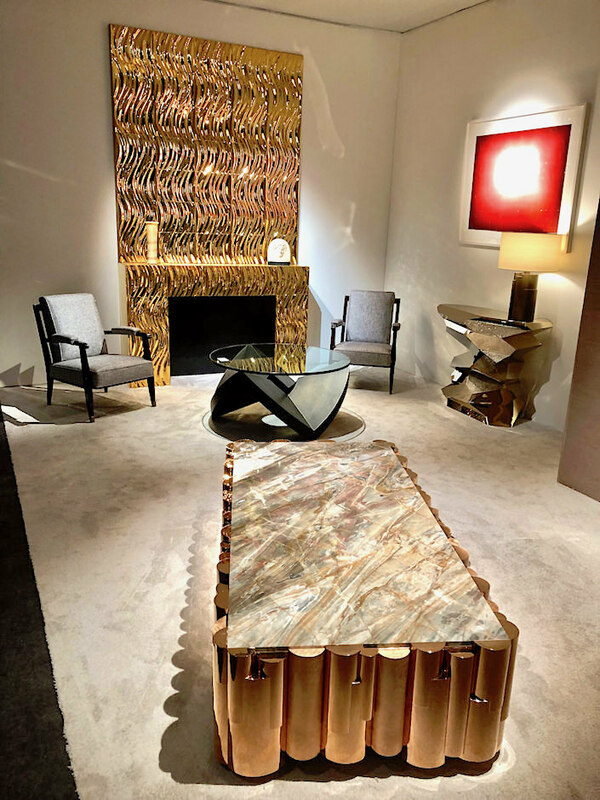 Luxe furniture makers Zelouf & Bell are newly represented by the gallery. 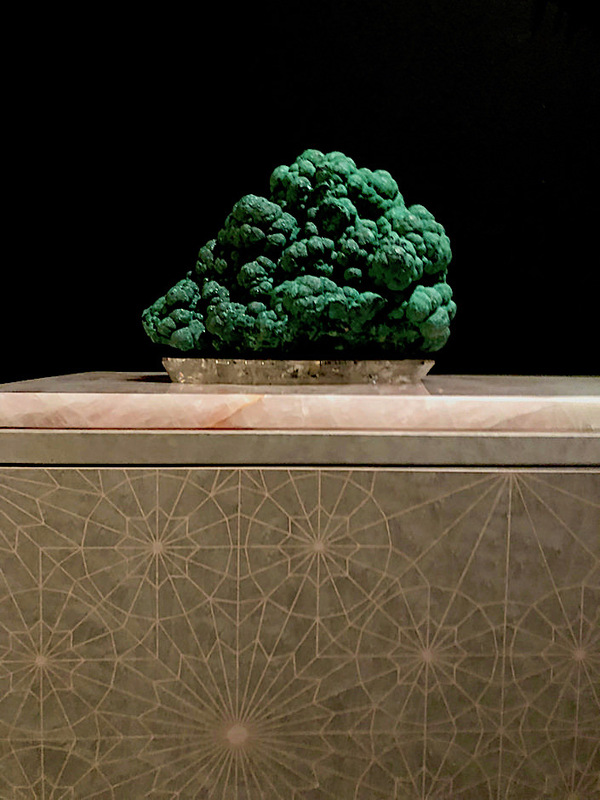 I had a chance to chat with designer Susan Zelouf and will hopefully be able to share more of their incredible work including their amazing artisanal marquetry, beneath a Studio Greytak malachite sculpture, below. 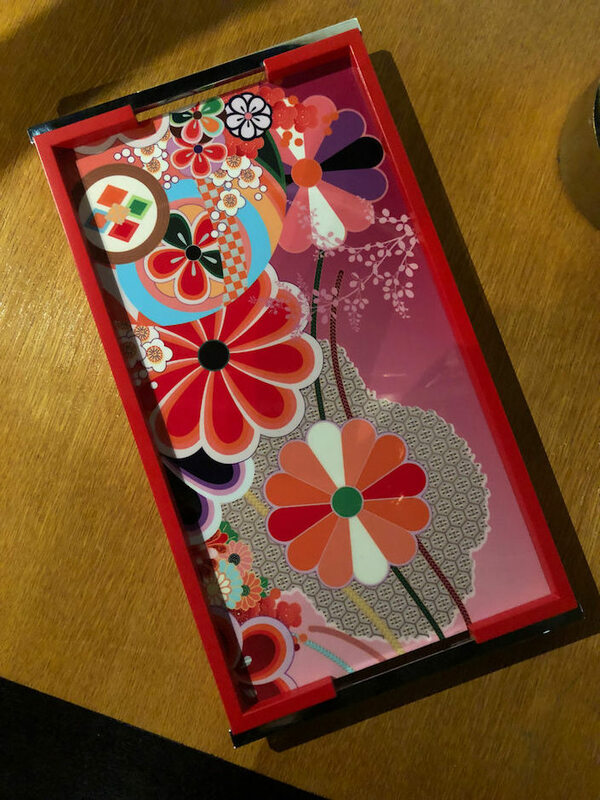 They also use a proprietary method to produce these fantastic Japanese inspired intricate patterned trays. 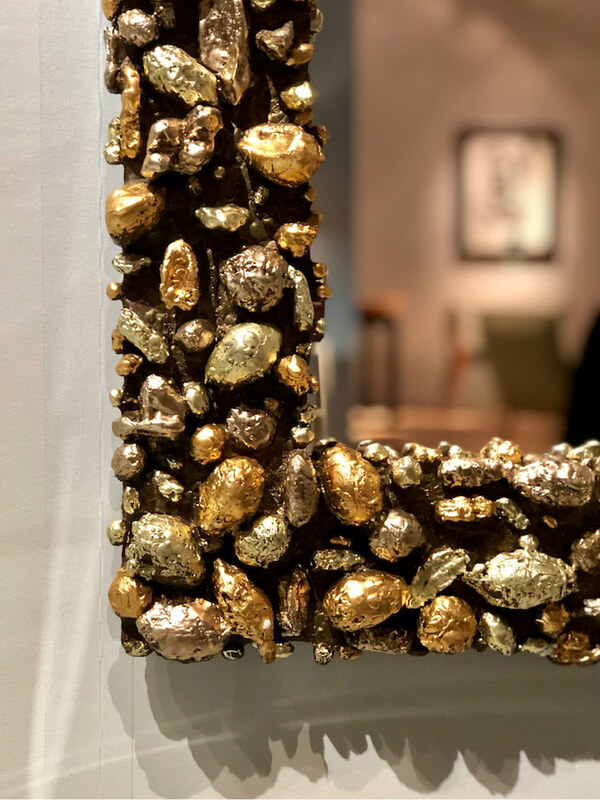 Line Vautrin has a cult following and nowhere did her work look more enticing that at Galerie Chastel-Maréchal. 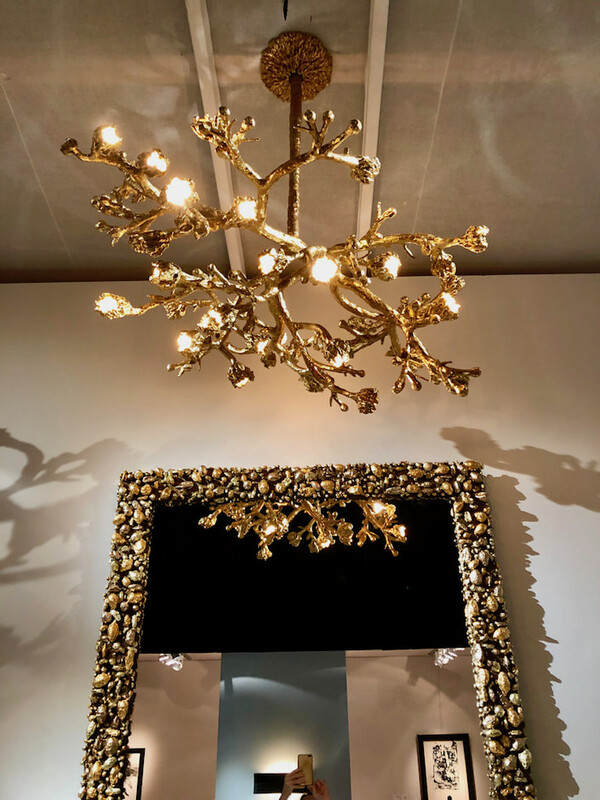 And speaking of mirrors, David Gill Gallery is showing a rather spectacular one, “Fertile Reflection,” by artist Michele Oka Doner with her “Water Flowers” chandelier above. 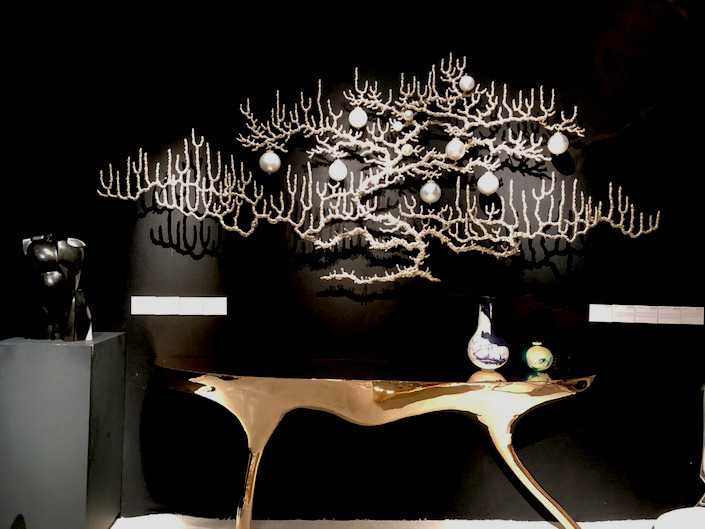 Garrido Gallery, from Madrid, founded by silversmith Damian Garrido and now continued by his children Juan & Paloma, present all forms of sculpture, furniture and functional art in metal. 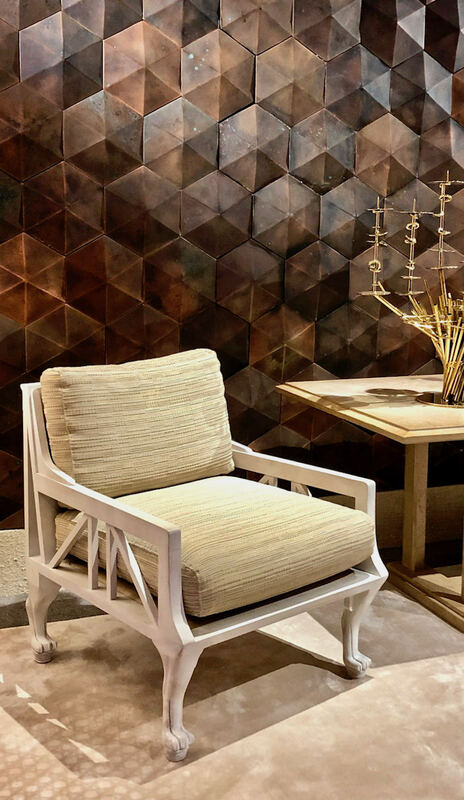 And while the large textural panel by Etienne Moyat at Galerie Negropontes may look like metal, it is actually carved wood. 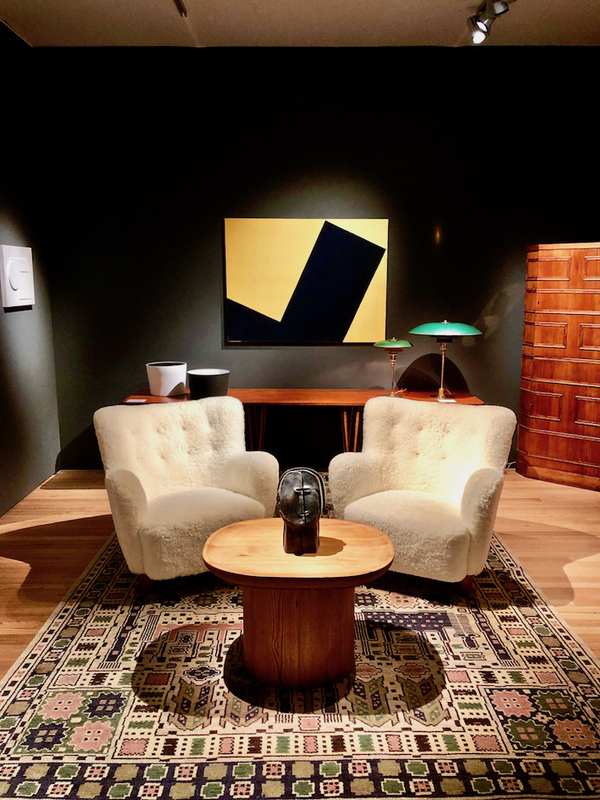 There is always something to admire at Swedish gallery Modernity and this year was no exception, from the Sven Hansson painting to 1940s Danish sheepskin armchairs to the 1920s Swedish “Hästhagen” rug. 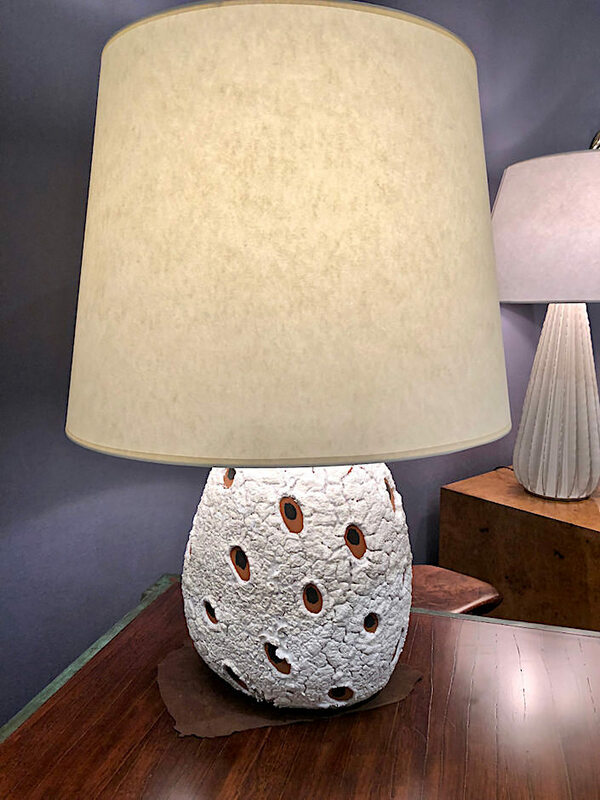 Demisch Danant always presents the best of 20th century French design (primarily 50s – 70’s) with serious scholarship and an understated and restrained elegance. 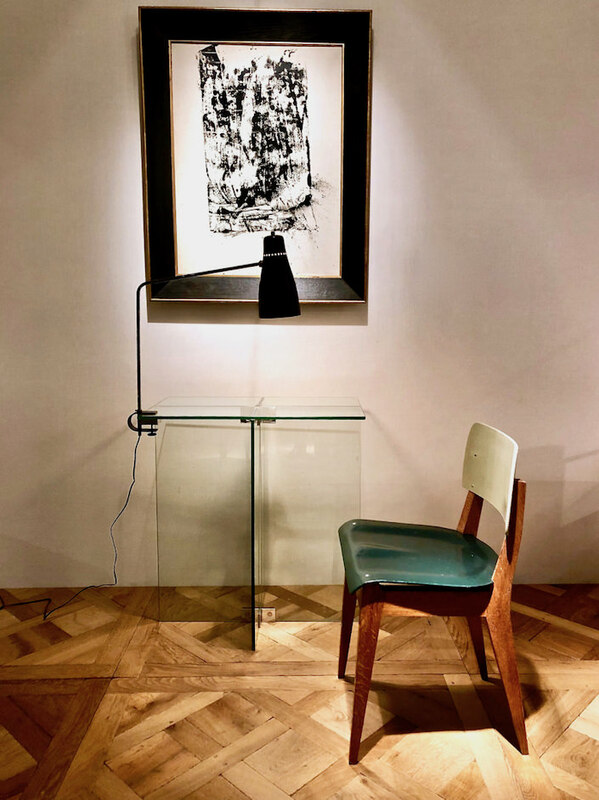 Below, a Dumond chair (one of six) and console with Pierre Guarich light and Arman painting. 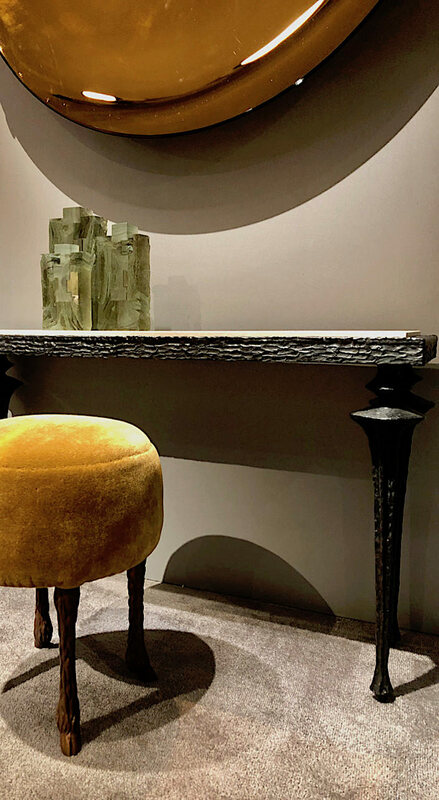 Maison Rapin presents several favorite makers including some glamorous Robert Goossens mirrors (which I neglected to grab a shot of) and the elegant work of Marc Bankowsky including his well known “Pied de Bouc” stool, below. 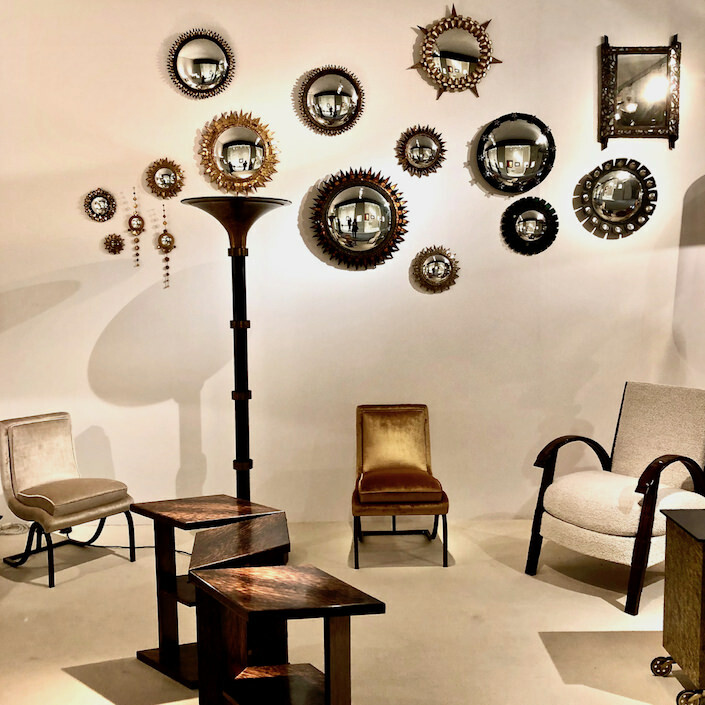 Also from Paris, Chahan Gallery has a marvelous pair of vintage John Dickinson armchairs from the 1970’s. 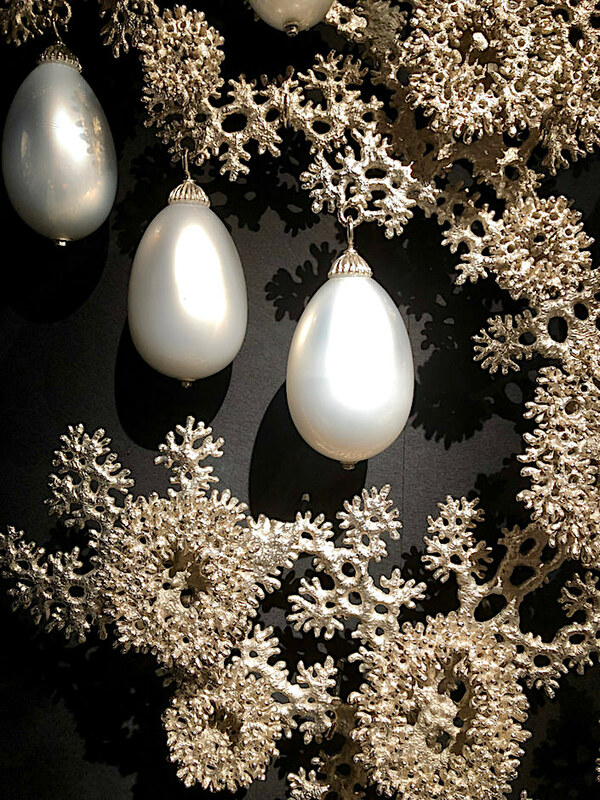 to Timothy Horn’s nature and 17th c. jewelry inspired sculpture, Gorgonia. 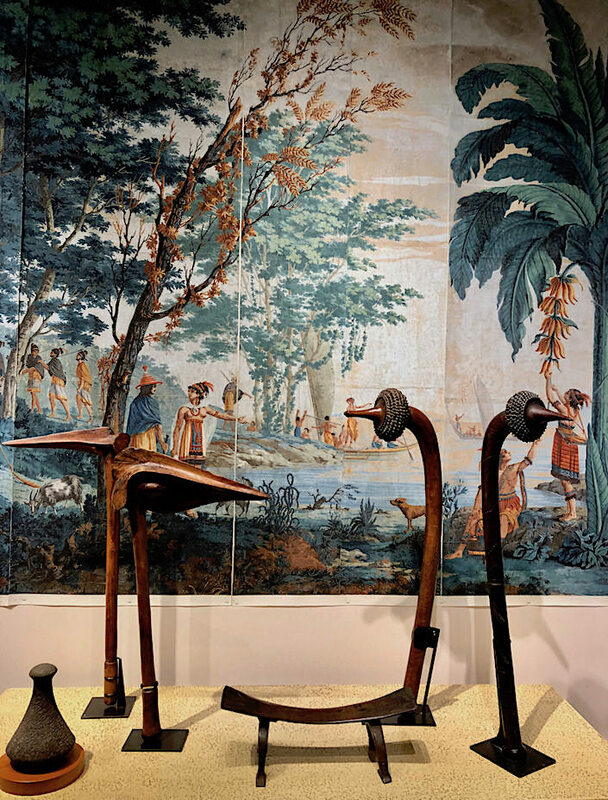 Antique wallpaper specialist Carolle Thibaut-Pomerantz brought a spectacular set of panoramic panels of “Voyages of Captain Cook” by Joseph Dufour, 1804, creatively paired with Oceanic tribal art from Charles-Wesley Hourdé. 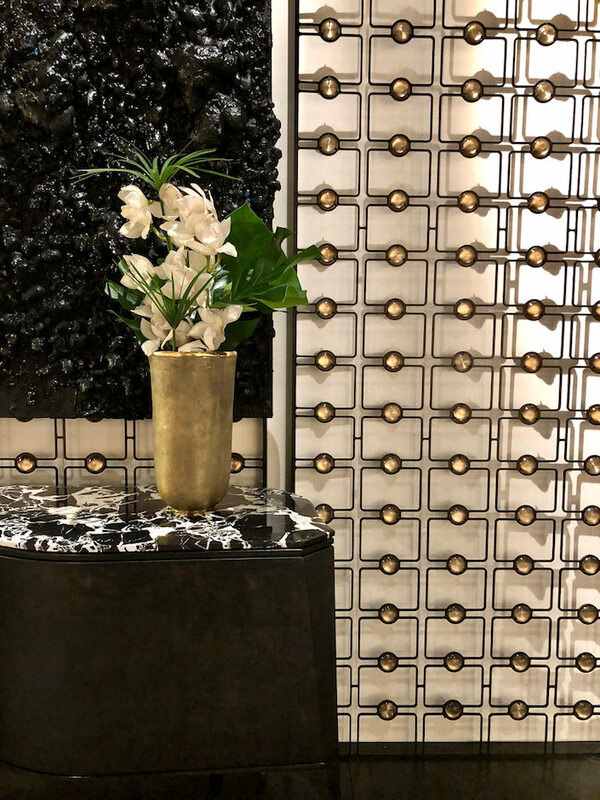 And one of the special installations features the partnering of designer Ryan Korban with Lalique. 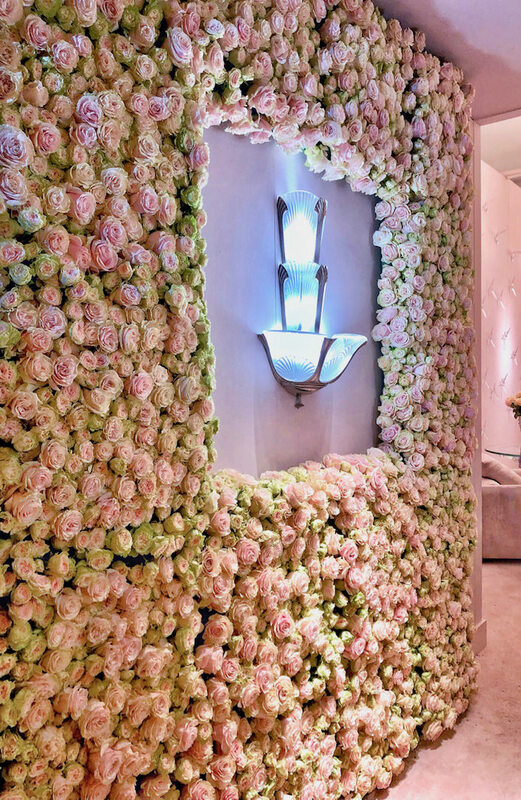 Enveloping the booth in a romantic blush pink, a wall of roses greets visitors to the modern space featuring Lalique interior design pieces alongside more decorative items. 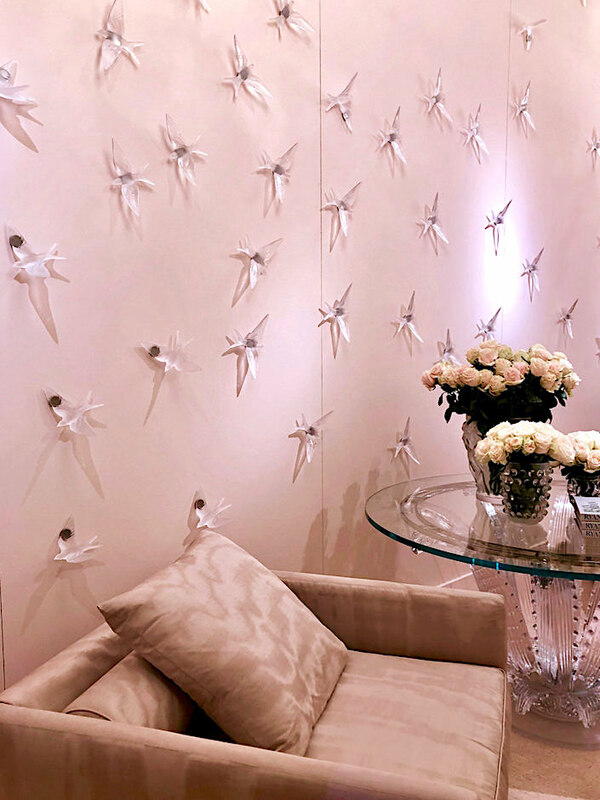 in the back, an amazing wall of straw marquetry with inset Lalique crystal panels was executed by Jallu Ébénistes. 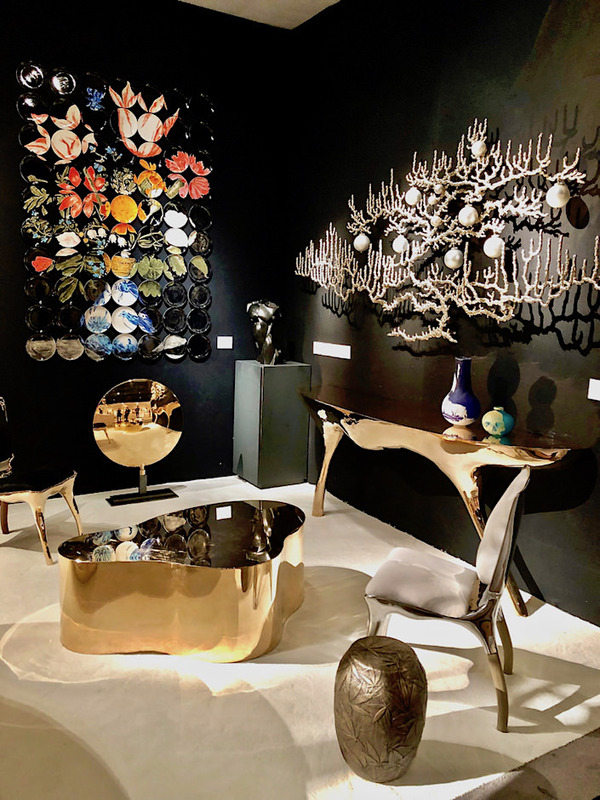 This is merely a tiny sampling of the many prestigious dealers and items to see at Salon before it closes tomorrow, Monday November 12 at the Park Avenue Armory. This entry posted in art, design, furniture, interior design. 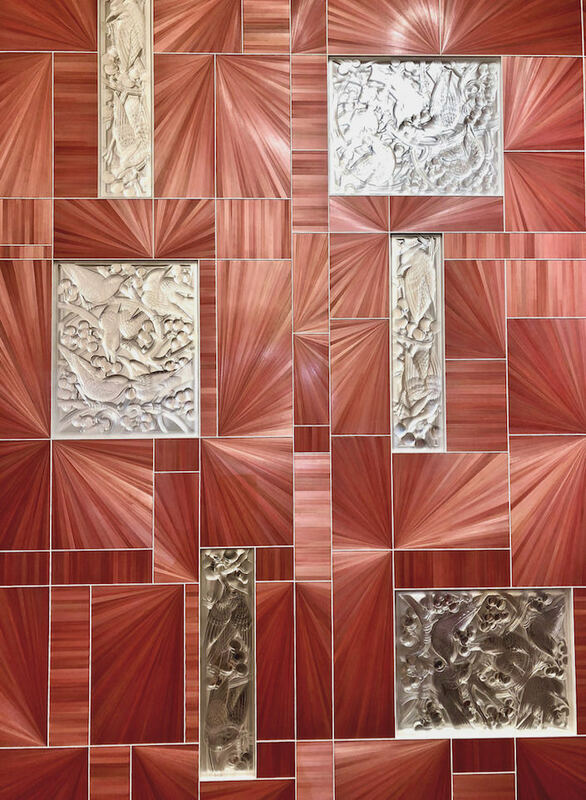 Entry Tags: art, art show, Collecting, decorative arts, interior design, Salon Art + Design Bookmark the permalink. A beautiful feast for the eyes and the design soul! Thank you , Stacey, for your so very creative coverage of this show. What an inspiring collection of images! That piece by Niamh Barry has my heart right now.